All schools have water fountains for filling up water bottles. 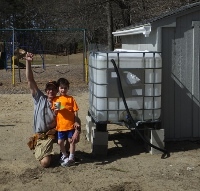 Claypit Hill and Happy Hollow Elementary Schools have large IBC totes that capture rainwater for irrigating the gardens. You make your bed, you lie in it. Loker BASE kids made this bed out of water bottles recycled from the lunch room for the Wayland Earth Day display on 9 April, 2011. 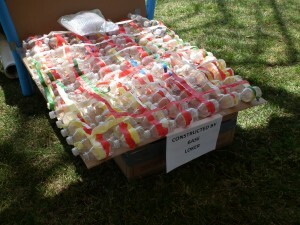 The Team does considerable outreach about reducing single use plastic water bottles. 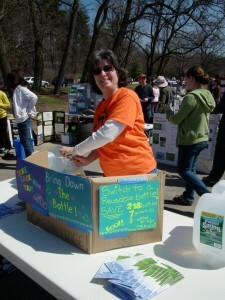 At the Wayland Earth Day Celebration in 2011, the Green Team did a blind taste test: can you identify which is the tap water and which is the bottled water? Which one tastes best? Most tasters didn’t taste a difference and had to guess. The best tasting water was in most cases the tap water. That comes as no surprise because tap water is closely regulated by the Environmental Protection Agency under the Clean Water Act of 1977. Bottled water is regulated by the Food and Drug Administration and is not subject to all the same testing requirements. People prefer tap water over bottled water 4 out of 5 times in blind taste tests. 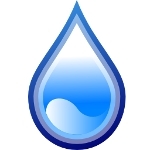 Tap water is easy to filter at home or at work. Tap water can be 1000 times cheaper than bottled water ($.002 vs. $1-$2 per gallon). Click here to see what a difference it would make to the environment if households switched from disposable to reusable water bottles. Click here to learn the staggering numbers of plastic disposable bottle and bag usage in America and what it means for the environment and your wallet!